It doesn’t look that windy – a bit breezy maybe and the trees are certainly moving about in the wild patch behind our garden. The heavy metal base the umbrella was in has moved off the patio into the middle of the grass too. It took all my strength to pull the umbrella out and I very nearly had a comedy moment when it came close to pulling me in, fully clothed. The umbrella is pretty heavy – when it isn’t wet I can’t lift it into the base safely. the Little One joined in at home as she pinched her finger in a tape measure I told her not to play with and then hit the Big One with a boomerang (that started the Big One off again). 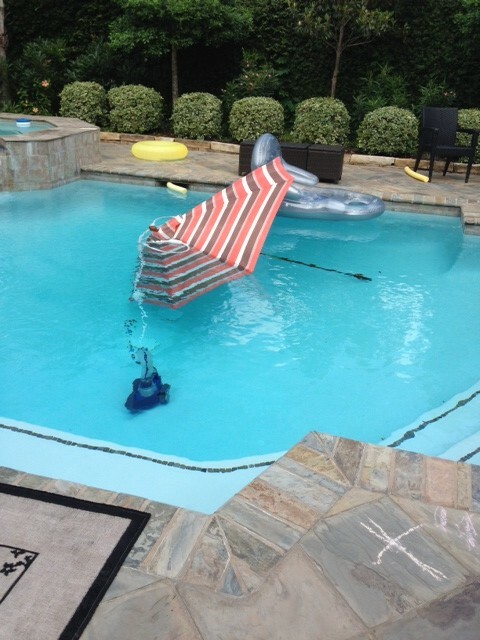 So, if it wasn’t for the fact that I know they can’t get inside the house before me when we’ve been out, I would suspect that they had pushed the umbrella into the pool just to annoy me. Peace has only just descended following 20 minutes in their bedroom (more for my benefit than theirs so I didn’t have to have the screaming right in my ear) and then the application of the drug that is Disney Junior. Unfortunately it’s only on in the mornings here and I only have enough recorded for half an hour of quietness. I wonder how many times they can watch the same programme before they start to complain? My Disney-induced peace is rapidly running out. I think I might just put on a few episodes of Octonauts. 15 episodes should be just enough to get me through until my lovely husband comes home and can take over. Now, where is the chocolate… Might just pay the children back by eating all their Cadbury Freddos!